If you enjoy spinning the reels on your desktop computer, there is a good chance you will love playing the slots on your smartphone or tablet even more. Portable devices and online slots make for a perfect combination due to the games’ simplified interface while the touch screen technology renders the gameplay far more engaging and stimulating. Touch screens allow for a greater interaction, which further adds to the entertainment value of these already enticing casino games. Mobile play comes with greater convenience and flexibility, which is why mobile casinos are have been gaining more and more traction in recent years. When it comes to slots, variety is what fans of this type of game value the most. Because of this, Android-compatible online casinos are a frequent stop for reel enthusiasts since they offer a staggering diversity of titles. The Android platform is home to some of the most popular slot games in the mobile gaming sector, not to mention it runs on a wider range of portable devices. It matters not whether you own an HTC, LG, Samsung or Sony Xperia smartphone, you will still be able to load your favorite mobile slots and play for real money on the go as long as your preferred online casino is compatible with Android-based devices. If you are willing to make the transition from desktop to mobile play on your Android device, the following article on Android slots may be of some interest to you. Before we proceed with the mobile play options Android users have, allow us to say a few words on Google’s policy in regard to real-money gambling content. As you probably know, the Android mobile platform is courtesy of giant Google, but the latter has opted for prohibiting applications that facilitate actual gambling on the Google Play store. This applies to all gambling-related content that involves players making real-money bets, including lotteries, sports betting and of course, online casinos. This, however, by no means should lead Android devices’ owners to the conclusion they are unable to play the slots (or other casino games for that matter) on their smartphones and tablets. Most, if not all, trusted gambling operators run websites that are fully compatible with portable devices, based on this operating system. Slot enthusiasts can still download and install real-money gambling content on their Android smartphones, but they simply need to do it directly from the websites of their online casinos of choice, provided that such applications are available for a free download. This course of action is actually more beneficial to players since online gambling operators that host free Android apps on their websites can tackle any security-related problems as soon as they detect them and update their apps straightaway. Google may have banned such apps from their Google Play store but this is not to say real-money gambling applications for Android are unavailable for download. Quite the contrary, they are – it is just that players cannot download them directly from the company’s official app store. As far as mobile play is concerned, players are provided with two different options. As was mentioned above already, one of the said options is to visit the website of your favorite online casino and download a native application for your Android device directly from there. Many gambling operators have been able to develop and introduce their bespoke Android applications to players, which can be attributed to the open nature of the popular operating system. This ensures slot fans will enjoy a smooth transition from desktop to mobile play. As soon as you install the app on your Android device, you are a few taps away from playing your favorite mobile slots and potentially winning big. Slot players will benefit from the native Android apps in a variety of ways. For starters, playing the available mobile slots via one such app will ensure a much smoother gameplay and one will rarely experience any lags, freezes or glitches. The quality of the graphics is not to be underestimated, either – slot players will immediately notice the visuals and animations are crisper and clearer on native apps. Some online gambling operators have no downloadable Android applications to offer but have opted for browser-based apps instead. This is to say, members of such online casinos are not required to install any additional software on their portable devices in order to gain access to the available mobile slot library. All they need to do is run their preferred web-based casino directly through their smartphone’s internet browser to be redirected to its mobile counterpart. This option is convenient if you do not feel like installing additional software on your device or simply lack the memory space to do so. On the downside, browser-based Android apps come with less impressive and clear graphics and it makes sense that the gameplay will not be as smooth as that on native apps. Occasionally, players may need to scan a QR code in order to download the casino’s Android app or sometimes, even to contact a representative of the operator’s customer support team to ask for a download link to be sent to them via email or text message. It all depends on the online casino you have registered with. Slot fans who are used to spinning the reels on their desktop computers or laptops will find that the experience on Android devices is similar for the most part. Again there is the option to choose from practice mode and real-money play, which is great when there are new additions to the mobile casino’s slot library since you get to test the new games on the go prior to risking your money. When it comes to slots, convenience is key because this particular type of game is rather dynamic and is played at a very rapid pace, which is to say responsiveness is everything. Android owners will be able to conveniently set the reels of their favorite slots in motion with a single swipe across their touch screens. Gaming controls are similar to those on regular desktop slots as you get to adjust your coin denomination, bet level and which paylines to activate. Additionally, respected casino software developers have spared no efforts when optimizing their most popular slots for Android-based devices. You will find the slots have been designed so that they fit the smaller display of your Android smartphone just right. Because the resolution on Android-based smartphones is far greater than that of desktop monitors, players will certainly be smitten with the clarity of the graphics and animations. As long as your wireless internet connection is stable enough, you will not suffer any lags during your gaming session. Android players will also be able to manage their accounts with ease, process deposits and initiate withdrawals on the go with a few taps on their phones’ touch screens. In many cases, Android owners are also granted instant access to the mobile casino’s live chat facility while on the go. Since Android is an open system, it runs on a great number of portable devices which in itself is also an advantage. Slot fans are typically given the opportunity to boost their balance while on the go by claiming various bonuses that are designed exclusively for mobile play. Some mobile casinos offer exclusive welcome bonus packages to new players as an additional incentive to download their native Android apps. If you are still new to playing the slots on the go but are willing to give them a few spins on your Android smartphone or tablet, you should read on to learn more about five of the most popular real-money slots that run seamlessly on this operating system. If you are a fan of the adult animated show that is South Park, you will surely appreciate NetEnt’s 5-reel creation with its 20 fixed paylines. Kyle, Kenny, Stan and Cartman appear as symbols on the reels to take players on an epic adventure filled with wild substitutions, rounds of progressive free spins, multiplying re-spins and four different bonus games, one dedicated to each of the main characters of the popular show. During some of the bonus games, players will additionally be able to benefit from multipliers of up to 10x their winnings. Betting limits are flexible with players being able to wager as little as $0.20 per spin while the maximum bet amount is set to $10. The graphics please the eye with their crispness while the gameplay is exceptionally intuitive and hassle-free as befits a NetEnt slot. The maximum jackpot amounts to 600,000 coins which further increases the game’s appeal. 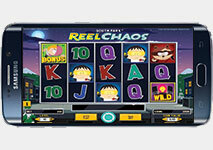 The slot is compatible with an extensive range of Android-based devices so make sure you give it a few spins on the go. There are plenty of reasons why this enticing Playtech 5-reel slot, with its 20 adjustable paylines, enjoys such a huge popularity among reel enthusiasts around the world. For starters, the game’s theme was inspired by the sultriness of summer as becomes evident by the symbols Playtech has selected for the five reels. These include freeze pops of different flavors, cones of tasty ice cream, scuba divers, and surfers. The game has also much to offer when it comes to extra features. The sandcastle is the scatter here while the bonus symbol is represented by a sunken treasure chest – land three to five of those on any active payline and you unlock the bonus game. However, the sun is the most coveted symbol in Beach Life since five suns on the 20th payline will earn you the gigantic progressive jackpot. Players who line up five sun symbols on any of the other nineteen paylines will not be left empty-handed as they are rewarded with a prize of 100,000 coins. Greedy Goblins is among the most popular creations of leading provider of online casino solutions Betsoft and it surely is easy to see why. The three-dimensional graphics and animations are superb, not to mention Android users can potentially end their gaming session by winning a fixed jackpot of 1,200,000 coins. Other than that, the game is played across five reels, with the option to bet on 30 fixed paylines. While players are unable to select which lines to bet on, betting limits are flexible with the option to wager anywhere between 0.60 and 150 credits per spin. 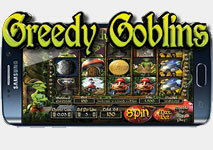 Greedy Goblins certainly does not lack in terms of features as players can benefit from rounds of Elfish Free Spins, Sticky Wild Reels, and Cascading Coin Drops. The Gamble feature, on the other hand, can potentially double or quadruple your profits on any winning spin. If you are a fan of Norse mythology, this Microgaming creation will greatly appeal to you as it was inspired by Thor, the hammer-wielding god of thunder, with symbols like war horns and lightings to fit the overall theme and feel of the game. 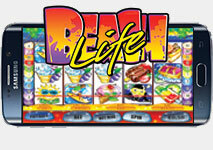 This is a 5-reel slot with 9 paylines and a fixed jackpot of 10,000 credits. The game has slightly cartoonish graphics and is not as visually impressive as some of Microgaming’s most recent slot creations, but still Thunderstruck has obtained the status of a classic among slot fans. 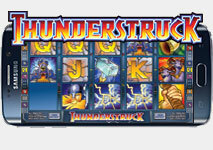 This excellent reputation is well-justified as Thunderstruck comes with a good range of extra features, including the scatter ram symbol which rewards lucky players with up to 15 free spins. The Norse god of thunder and lighting himself is the wild in this slot. It not only substitutes other symbols on near misses, but also doubles players’ profits on winning spins. Being an absolute classic among reel lovers, Thunderstruck has been adapted for various portable devices, including those that operate on Android OS. 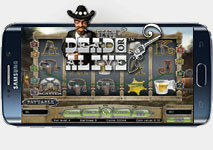 NetEnt takes reel lovers on a journey to the Wild West with its visually superior 5-reel slot Dead or Alive. The game is played across 9 adjustable paylines and its wide betting range renders it suitable for both risk-averse and daring slot fans. Since Dead or Alive is set in the American West, it incorporates suitable symbols such as sheriff badges, cowboy hats, gun holsters, and pairs of cowboy boots. The design of the slot is a bit simplified but this only works to the advantage of players. The symbol with the pair of crossed guns functions as a scatter and can potentially trigger a round of 12 free spins with a 2x multiplier on winnings. The Wanted Outlaw poster is the wild in the game and can help players hit more winning combinations as it substitutes for all symbols save for the scatter. When free spins are re-triggered, this symbol is transformed into a sticky wild and remains in place on subsequent spins during the re-triggered bonus round.